He was born in Kurdistan Region-IQ in 1981. Adam started his journey in 1996 when he attended the Institute of Fine Art in Duhok. In 2001 he graduated from the Institute of Fine Arts in Duhok with a Diploma in Painting. 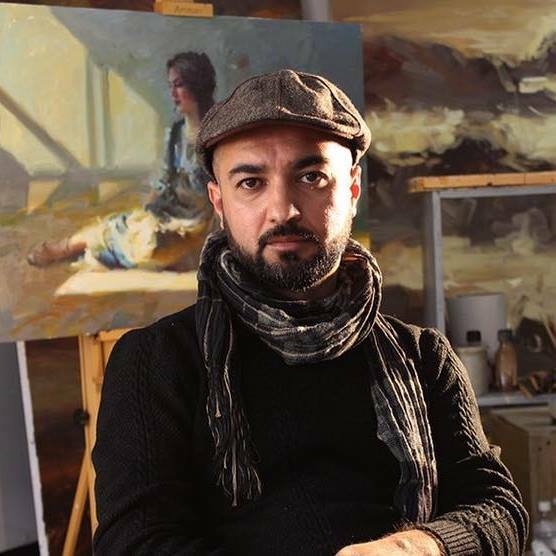 In 2004 he attended College and earned his degree from college of Fine Arts Salahaddin University in Erbil with Bachelor Degree in Painting. He worked seven years as an art teacher in different schools including the Fine Arts Institute of Duhok. He attended the Academy of Art University in San Francisco, CA in 2012 and in 2015 got his master degree in contemporary realism as a figurative artist. He is currently instructor in Fine Art Institution in Duhok, and part time adjunct at AUK and CU. The purpose of his paintings is to highlight the soul of the Kurdish woman in her traditional costume. His intent is to depict the connection between Kurdish woman and clothing worn by women in society. This is achieved by shedding light on traditional Kurdish female costumes and the meaning behind the colors and symbols of outfits which have different shapes, styles, designs, and societal meaning. In addition to the symbolic meanings, the design of the dress projects an inner mood and expression often overlooked by Kurdish culture.